The Sinfonia CS2 printer provided with your HootBooth Photo Booth is capable of cutting your prints down the middle, providing you with two 2x6 strips of your photo session. 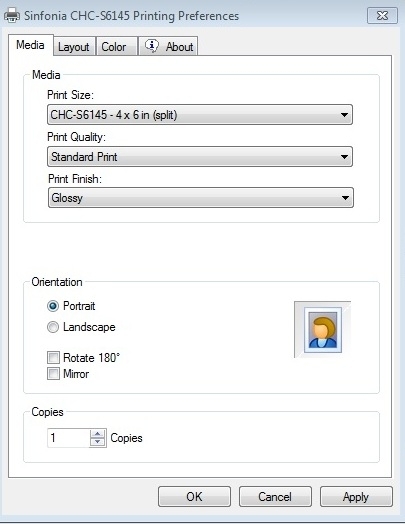 Depending on how you have set up your template layout, you may wish to use this option as a means of providing your users with two identical photo strips while also using less printer paper. Follow the steps below to enable printer cutting. Note: Close your Photobooth software before performing these steps. Scroll to the bottom of the ‘Devices’ menu and click ‘Devices and Printers’. The screen below will appear. 4. Right click on the ‘Sinfonia CHC-S6145’ icon with the green check mark. Select ‘Printing Preferences’. The screen below will appear. 5) In the ‘Print Size:’ drop-down menu you will find the option for ‘4x6 in (split)’. Select this option. Note: This is also where you can change your print Orientation.